The benefits and responsibilities of being a KD. Kappa Delta offers each member endless opportunities to grow as a person and learn life skills that will prove invaluable throughout her lifetime. Members find support for personal growth, leadership in the chapter and on campus, participation in community service and involvement in other initiatives that are important to them. 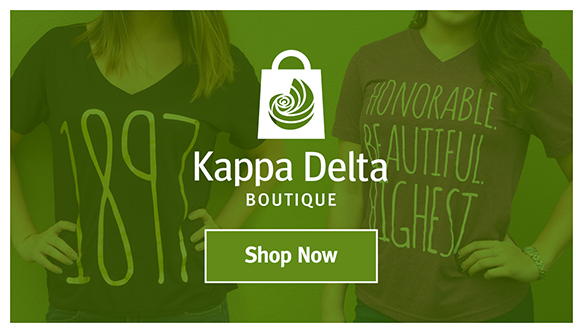 Another benefit of membership: The Kappa Delta Foundation offers scholarships and internships to exceptional members. Find out more. Best of all, KD is for life! From the moment they join, members become part of a national network of women committed to building confidence in women and girls around the world. Membership in Kappa Delta also comes with expectations. Kappa Delta’s standards of responsible and ethical conduct provide a framework for behavior that is consistent with our common values. Members are expected to live with integrity and hold each other accountable. Kappa Delta expects its members to “strive for that which is honorable, beautiful and highest” at all times. We also expect members to make academics a priority and meet the standards set by the chapter. Furthermore, members are required to attend chapter meetings and other required chapter functions and uphold their financial responsibilities to ensure the chapter — and the national organization — run smoothly.